We will take a look at Schiff from two perspectives shortly. First let's note the massive influx of workers into Chinese cities is now in reverse as Chinese job losses prompt exodus . Tens of thousands of migrant workers are leaving the southern Chinese city of Guangzhou after losing their jobs, railway officials say. The increase to 130,000 passengers leaving the city's main station daily is being blamed on the credit crunch. Guangzhou is one of China's largest manufacturing hubs, but many companies who export products have collapsed. Chinese officials are worried that a sudden increase in unemployment could lead to social unrest. The most badly hit export companies are toy, shoe, and furniture manufacturers. There are already reports of demonstrations and social unrest in the provinces of Zhejiang and Guangdong. Here are a few headlines about the Chinese to exporting business. A total of 3,631 toy exporters or 52.7 percent of the industry's businesses shut down in 2008. They were mainly small-sized toy producers with an export value of less than $100,000. Workers at a toy factory in Guangdong have become the latest victims of the worldwide financial tsunami. More than 6,000 employees lost their jobs when Smart Union, a major toy manufacturer in Dongguan, closed earlier this week. "The main reason for the closure is we are too dependent on the US market, which has become sluggish," said Xu Xiaofang, a Smart Union human resource worker. After losing money for the first half of the year, its cash flow finally dried up. Machinery normally busy churning out toys for major US toy brands Mattel and Disney now sits idle. Speaking in an interview with Guangzhou Daily, Wang Zhiguang, vice-chairman of the Dongguan Toy Industry Association, said: "Of the 3,800-odd toy firms in Dongguan, no more than 2,000 are likely to survive the next couple of years." Xiao Yong, the owner of a Dongguan firm that sells Christmas trees and gifts, is equally worried about what the coming winter might have in store. "One of the main problems is that many toymakers in Dongguan rely too much on orders from the US and Europe. The financial crises there have led directly to a reduction in orders," he said. The number of orders his firm has received for this Christmas is about half what it reported last year, he said. Two sub-contract manufacturing factories under one global toy maker in South China's Guangdong Province have collapsed, in the first bankruptcy case for the substantial economy in China, according to today's National Business Daily. The two factories, located in Zhangmutou Town of Dongguan City, were toymakers for Smart Union Group (Holding) Ltd, one of the world's largest manufacturing and trading companies in toys and recreational products on an original equipment manufacturer basis. All the products were being sold to the United States. •An export-killing global slowdown that began with the collapse of the U.S. housing market and the ensuing financial crisis. •Rising materials costs that have squeezed profit margins. •A deliberate Chinese government campaign to regulate sweatshop factories out of business. The Chinese economy is absorbing another blow beyond crumbling exports: collapsing home prices. Nicholas Lardy, senior fellow at the Peterson Institute for International Economics in Washington, D.C., reckons a slowdown in construction could shave another 1 to 2 percentage points off China's economic growth. "The property bubble is already starting to burst," says Yan Yu, a business management scholar at Peking University, researching the export center of Dongguan in southern Guangdong province. "House prices here in Dongguan have fallen by up to 50% this year," leaving many homeowners owing more on their mortgages than their homes are worth. "People have worked all their lives and believed the hype and bought overvalued properties, then saw their savings vanish," says independent economist Andy Xie in Shanghai. "That carries more political risk" than rising joblessness. The Wall Street Journal is reporting China Announces Major Stimulus Plan . China announced a stimulus program that could exceed half a trillion dollars, its biggest move yet to rebuild rapidly weakening confidence and unleash domestic demand to counter the prospect of global economic recession. The package of infrastructure investment and other stimulus measures is to be spread over the next two years and appears to include some measures that were already announced. Still, the huge scale of the planned response -- potentially 4 trillion yuan ($586 billion) -- underscores how rapidly the outlook for China's once-booming economy has worsened and how the country remains comparatively well-placed to deal with such a slowdown. Other governments around the world are also considering fiscal stimulus plans to boost their economies, something the International Monetary Fund has encouraged. U.S. lawmakers, during their lame-duck session next week, are expected to consider a stimulus package focused on aid to local governments and extended unemployment benefits. U.S. House Speaker Nancy Pelosi is pushing for a two-step plan with as much as $100 billion this month followed by a companion measure early next year that would include a tax cut. Outside economists are urging Democratic congressional leaders to move a much larger package -- as much as $300 billion, or 2% of U.S. economic output -- as the U.S. economy faces one of its worst recessions since the 1930s. China's plan appears to be comparable in size. In a statement announcing the plan, China's State Council said it would deliver 120 billion yuan ($18 billion) of new spending in the last quarter of this year alone. The State Council -- effectively China's cabinet -- estimated that would drive an additional increase of 400 billion yuan in local and private-sector investment throughout the economy. China's government is also making plans for new spending in areas such as low-cost housing, road and rail infrastructure, agricultural subsidies, health care and social welfare over the next two years. In the video, Peter Schiff rants and raves about clueless economists and more spending and fiscal stimulus and states "We need that like a hole in the head". And on that point he is entirely correct. I totally agree with Schiff. The cause of the economic crisis we are in now is a result of reckless spending and loose monetary policy. If reckless spending was the cause of this mess then reckless spending cannot be the cure. On that basis I nominated Schiff for my "Summit Of Winners". See Bush to Host Summit of Losers for more details. After that initial opening, Schiff jumps off the deep end with a "print print print" rant about hyperinflation, a huge rant against Obama, talk of recovery in his funds, and finishing up with "There is no way the dollar can possibly survive what is coming". The big thing Schiff missed this year was in his decoupling theories. Schiff invested as if the US would crash and that everything else would be fine. The decoupling theory never made much sense. To believe in decoupling is to believe the tail wags the dog. And instead of saying how much his fund is up off the lows, he ought to disclose precisely how his anti-dollar fund plays are doing this year. What happened was that although the US stock market collapsed, China, India, Iceland, Japan, the UK, and numerous other places collapsed more. So when the dollar rallied on top of that, investments in those places got mercilessly hammered. Even though the US dollar index fell from 120 to 70, Schiff was still looking for a collapse of the dollar. It had already collapsed. The UK and ECB are doing the same thing (bailing out banks), and the UK is arguably in much worse shape than the US overall. Finally, there were many signs the US dollar were going to rally and those signs were pointed out in real time on this blog. For the record, I am now neutral on the US dollar as the US dollar index came close to hitting my target. Last week the U.S. Federal Reserve moved one step closer to acknowledging reality. Deflationary pressures have never been greater in the US, UK, EU, Canada, Australia, and other countries. Collapsing debt bubbles, rising foreclosures, rising defaults, and rising unemployment are deflationary forces. And those forces are global, not just in the US. Yes, the US is going to print but so is everyone else. In isolation, what looks awful for the US, does not look so awful in relation to what every other country is doing. This should be a good backdrop for gold and that is another point on which I agree with Schiff. Intermediate term, we could both be wrong. And while there will be printing under Obama (by the Fed), at least that printing is likely to go for something. Money spent on infrastructure is far more dollar friendly than money used to blow up Iraq. There is also a chance that Democrats and Obama slash military spending, and if they do, it will be a dollar friendly thing. I am not here to defend spending programs for the simply reason I do not agree with them. I happen to agree with Schiff. My disagreement is what the net result will be. Japan spent like mad and the Yen still rose. If the rest of the world spends like the US does, it is certainly possible the dollar keeps rising as well. What's arguably more likely is that the dollar stabilizes within a broad range. One thing that is for certain is that nearly everyone, especially Schiff, failed to see the deflation we are now in. And rest assured it is deflation that central bankers across the globe are fighting. Schiff needs to get off his anti-Obama, anti-dollar mindset and take a look at the global economy and problems elsewhere, especially in China, the UK, and the Eurozone. That video proves he is not capable of doing so. It equally proves he does not fully understand the deflationary forces of Peak Credit and the global debt unwind that are happening. For a previous debate with Schiff please see Not Your Father's Deflation: Rebuttal and Peter Schiff Replies to Deflation Rebuttal . Looking ahead, it is quite possible that if all pegs were removed and the Renmimbi allowed to freely float, that the Renmimbi, not the US dollar would crash. Certainly the pound could crash (I think that is likely), and the EU might even break up. The tremendous irony is that I happen to agree with much what he said in the video. I certainly am not bullish on US equities, nor am I in favor of the programs that are likely to come out of Congress. However, when it comes to global conclusions and the US dollar, I think it's a case of Hugely Right, Enormously Wrong, at least over the intermediate timeframe. After the debt bubble unwinds, then and only then will inflation become the primary threat. Peter Schiff is absolutely consistent in his message. Mish, on the other hand, goes in and out with the tide. One day says one thing, next day another. Can't conceive of conspiracies, such as the one holding down gold, silver and numerous other commodities. Mish just doesn't get the big picture. He still believes in "the system". Still believes the dollar has a future. 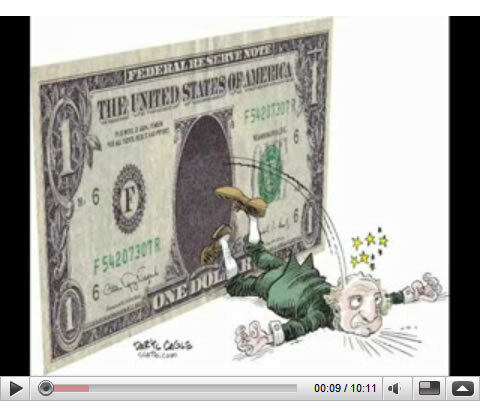 Still believes the dollar will remain the world's reserve currency, _forever_, no matter what the Fed and Treasury do. Might want to check your facts on Canada. The comment that the housing bubble is bigger than in the US is ludicrous. OK, lets begin by looking at the originator of this information; Michael Shedlock. "Please consider US Manufacturing Orders at 60 Year Low, China Contracts 5th Straight Month. * China’s manufacturing contracted for a fifth month. * European Manufacturing Contracts At Fastest Pace On Record. * Russian Manufacturing PMI Shrank the Most on Record. * U.S. Manufacturing Shrinks as Orders Hit 60-Year Low. That's not decoupling, that's a worldwide recession." Central bank governor Zhou Xiaochuan was quoted by the South China Morning Post as saying: "The US dollar is unlikely to be stable next year and later. Of course, Shedlock doesn't mention any of this in his Blog, because he is trying to promote the idea that China is in more trouble than we are. This is utterly false. What this collapse comes down to is DEBT. Who has it, and who owns it. China is not in debt. The U.S. is far into debt. The Yuan will become a much more viable currency, while the Dollar will disintigrate. Economically speaking, China is in a position to survive the coming collapse, which is more than I can say for the U.S.
"Schiff asks "But what if it keeps falling? What if it's down 5% next week? And 5% the week after that? And then what if it drops 10%? ...."
That was quite some rant, enough to scare many who listened. Schiff is indeed very charismatic. He never bothers to ask, "What if it doesn't?" The answer was not so pretty for his clients. The simple fact of the matter is Schiff was wrong where it mattered. Schiff has been ranting about hyperinflation for years. The dollar is substantially higher now than it was at the start of 2005. His explanation for the recent rally is there is no "real demand" for dollars, it's just deleveraging. I agree that deleveraging is indeed happening. But why is deleveraging happening? The answer is everyone herded into anti-dollar plays based on decoupling and hyperinflation theories that did not pan out. Those trades are now being forcibly unwound. The bulk of the carnage is likely over but the losses have been immense." Shedlock is completely off the mark. "The dollar is substantially higher than it was at the start of 2005"? Against what? This is a complete falsehood. The US dollar has now lost more than a third of its value (-35%) against a basket of major currencies since Feb 2002. Shedlock may be referencing the Dollar's recent rise against the Euro, but this short term increase is nothing compared to what the dollar has lost over the past several years. He refuses to look at the long term trend, instead focusing only on the short term favorable positions that happen to pop up. So, what if the DOW is up 200 points tomorrow? In Shedlock's fantasy world, does that mean the nearly 40% loss in market value the DOW has incurred over the past year 'doesn't count'? This is slapdash economics at its finest. Next, he again makes the claim that Schiff was wrong about Hyperinflation, even though the Economic Collapse has barely begun. His entire premise anchors on the idea that things will stay exactly the same as they are now. This is complete ignorance. He goes on to pronounce that deleveraging of the dollar has occurred because "everyone herded into anti-dollar plays based on decoupling and hyperinflation theories that did not pan out" are now jumping ship on their "bad bets". He presents no basis for this theory. He also does not consider that this is a short term situation caused by the chaos of credit markets, especially in Europe. Again, Shedlock must assume that the current circumstances will stay exactly the same in order for his theories to work. And now that the Federal Reserve has dropped interest rates to effectively zero, money creation will increase exponentially with every passing quarter. How can Hyperinflation NOT OCCUR!? "Schiff continually compares the US to Zimbabwe. Such comparisons are silly. Please consider Zimbabwe to launch 100 trillion dollar note. Does that sound like anything that is happening or is going to happen in the US? I think not. However, let's assume for a moment that hyperinflation is going to happen. Where then could one get the most bangs for their buck to take advantage? The answer to that question is in real estate, where one can buy on 5% down. Nowhere else can one easily get such leverage. Note that there has never been hyperinflation in history where real property declined in value. Therefore, if Schiff really believes in hyperinflation, he ought to be suggesting that his clients buy houses. However, Schiff thinks housing prices will continue to crash. So do I. And if they do, you can kiss hyperinflation theories goodbye. This is a laughable premise by Shedlock. First off, Hyperinflation is unstoppable in an economy that continually prints money out of thin air to cover its debt. This is so simple a child could understand it, but apparently not Shedlock. He then tries to bring in Property Investment, as if it has any bearing on the mechanics of Inflation whatsoever. In a Hyperinflationary crisis, who has the money or opportunity to invest in property? Only the super rich, which I suppose, is the point. Next, he claims that if housing prices continue to decline, then there can be no Hyperinflation? Shedlock fails to realize that hyperinflation of the Dollar has nothing to do with the housing market. He makes the dubious connection based on God knows what. Also, property is not necessarily the best investment in a Crisis Climate. Gold, however, is, because you can take it with you wherever you go. Shedlock is like a naive child facing a reality he has no experience or comprehension of. As a result, his solutions will always fall short of practicality. Shedlock then boasts that his clients have made substantial gains because his company invests in Treasuries while Schiff's clients have lost money. Of course, short term gains are not evidence of long term prosperity. Treasuries will decrease in value as our currency inflates and other countries such as China are forced to pull out of the Dollar. It is inevitable. Two years from now I would love to compare the portfolios of Shedlock's clients verses Schiff's to see who came out on top. My bet is that Shedlock's company won't even exist in two years. A common misconception by Main Stream Economists is that deflation in markets is proof against inflation of currency. Shedlock makes this same mistake. The problem here is a lack of foresight. Shedlock's own company guideline states that they do not commit to a "rigid position as to what the market "should do", Sitka Pacific Capital Management tries to position itself for what the market is doing." Meaning, Shedlock is not interested in the future, only the present. While a noble attempt to sound rational, this is not a wise foundation for an investor. Investment is about looking ahead. Often much further than just the next quarter. Shedlock is completely incapable of this, and he will lead his clients to ruin. Inflation takes time. While certain markets, such as oil, deflate due to lack of demand, others remain in stasis. Go into any grocery store and see if prices have moved substantially downwards. You will find that prices have actually gone up in many cases, even though energy prices are down. Shedlock claims that Deflation is "not debatable". As a consumer, I beg to differ. Wherever he seems to be finding deflation, it is having very little effect on actual retail prices, and in markets that DO have noticeable deflation, like oil, Shedlock will soon find that this is only temporary. Why? Because inflation has not kicked in yet! It takes a little less than a year for newly printed currency to circulate fully through the economic machine. Shedlock jumps the gun over an over again. Deflation in markets does not mean that Inflation of the Dollar is not occurring. As a finale, Shedlock claims that he has "heard" from two clients of Peter Schiff's investment company, Euro Pacific Capital. According to these two anonymous sources, Schiff has lost them a great deal of money. He then produces an alleged portfolio of one of these clients. I find this story hard to swallow. One, because I fail to see any reason why these two "clients" would be afraid to come out in the open and go on the record. What, are they afraid Peter will have them killed? It really makes very little sense. Two, anyone who invests with Schiff should know that it will be for the long term. Investments in commodities and Foreign Currencies come to fruition AFTER inflation has kicked in, not before. Why would anyone invest with Schiff, then pull their money out just as the collapse was BEGINNING? Short term losses do not necessarily translate to a lack of long term gains. This is basic investment strategy, and Shedlock completely ignores it. So lets be painfully clear, we are only at the onset of what will be the worst Financial Meltdown in history. Denying it will not make it go away, and will not protect your savings. Shedlock represents the many shortsighted and impotent investment strategists in this country. His views are completely illogical when applied to the greater picture, but as long as he only accepts facts that support his position and ignores all those that contradict it, he will fool himself and others into believing they stand on solid ground. Only after the collapse has moved into its middle phase (which should occur in the next 6 months) will he realize his folly. Certainly, some of Schiff's clients may lose money, but will they lose everything like those who invest with Shedlock? Or those who have no plan at all? I suspect they will be in a much better position than the rest of us.